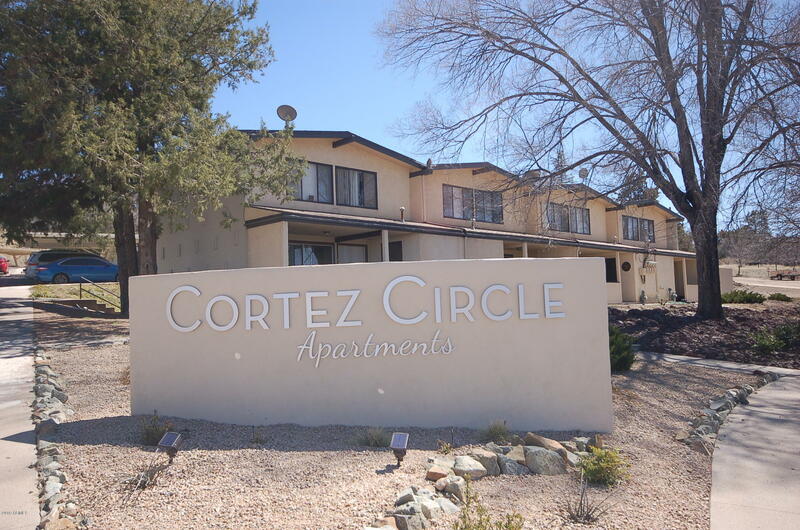 All Prescott homes currently listed for sale in Prescott as of 04/18/2019 are shown below. You can change the search criteria at any time by pressing the 'Change Search' button below. 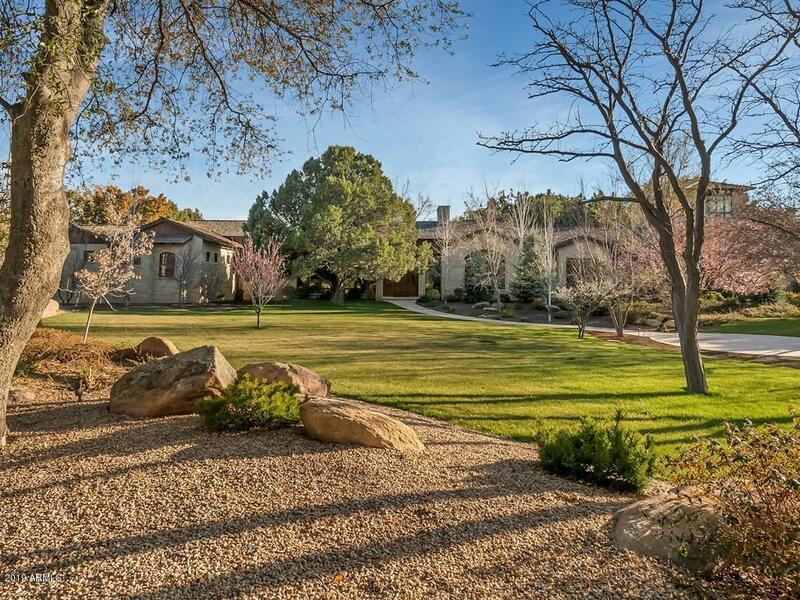 "One of Prescott's premier homes situated on private, gated and level 3+ acre lot. This stone limestone mansion features soaring beamed ceilings, spacious room sizes, Master suite + 3 Ensuites, His Office, Her Office plus craft room plus Tower Room plus oversized 4 car garage and storage. Room for RV parking. Private well." "38 UNITS (1&2 bedrooms)Ideal Unit Mix For This Submarket and DemographicBlock/Frame/Stucco ConstructionMajority Townhome-Style FloorplansLow Density Site (9.84 Units/Acre)Ample ParkingWalking Distance (0.5 miles) to Historic Downtown AreaMany Recent Interior UpgradesAdditional Land Available For 28 Units (2.96 Acres)Individually Metered UtilitiesOn-Site Pool and Fitness CenterWasher/Dryer Hook-Ups in All UnitsIn-place, private-party, assumable financing (+/- $1,837,500 balance, 5%interest-only, "
"The Grand Lady of Thumb Butte, stunning French Country Estate. 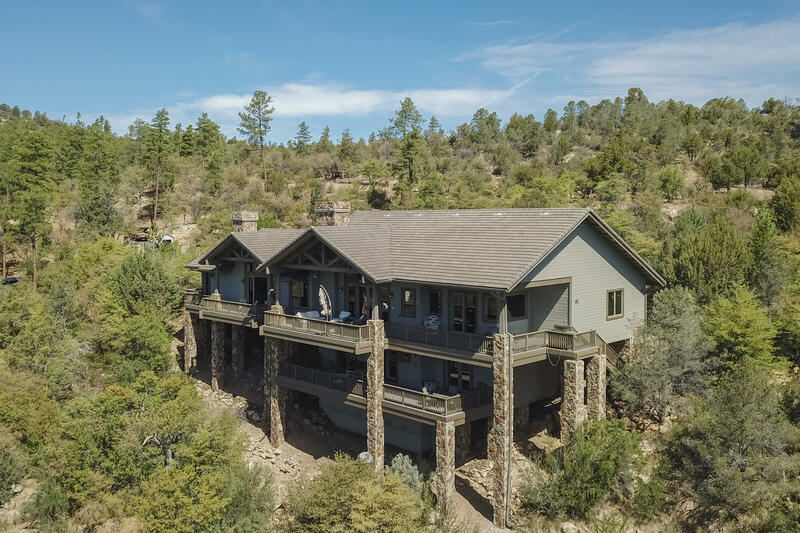 Elegantly nestled on 7 acres with horse privileges and numerous mature trees, this Architectural Masterpiece is just minutes from downtown Prescott. The main residence approx. 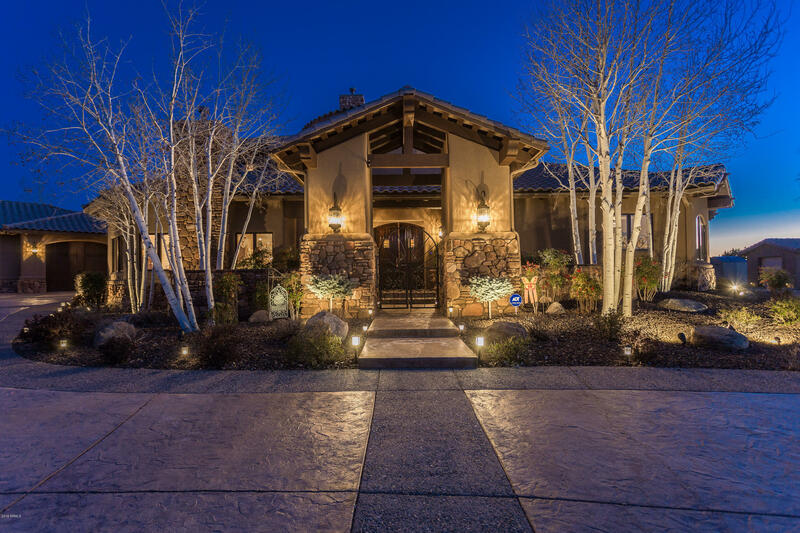 6,100 SF offers single level living with grand foyer entrance, decadent master bed/bath retreat, library, living room, conservatory, wine cellar, laundry, dining room, chef's kitchen with double islands, breakfast nook, and family room. 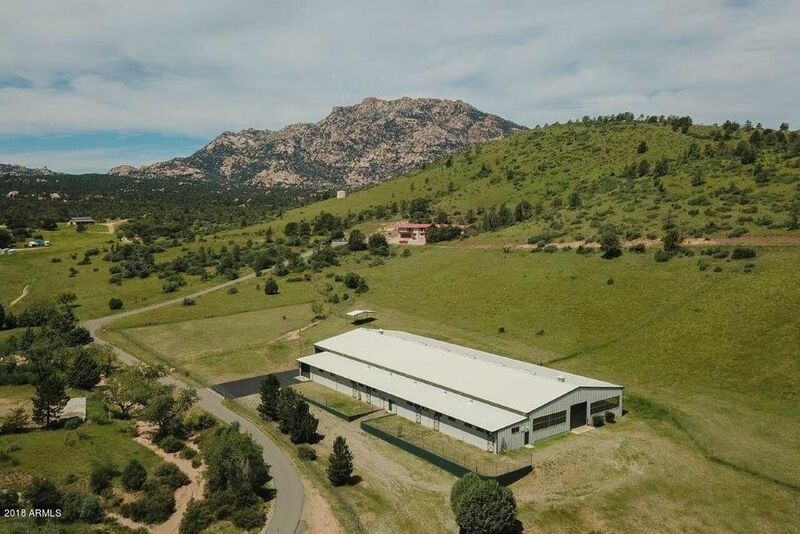 Second level offers 2 gr"
"111 acres located towards the back of Long Meadow Ranch, this recently remodeled property has spectacular views and a perfect setup for horses. Beautiful barn with exposed beams and tongue and groove ceiling and walls. 7 stalls with turn outs, wash area and one bedroom apartment, office, 3/4 bath and tack room. Large mare barn and round pen, including multiple different gated corrals. Property has good water in wells." 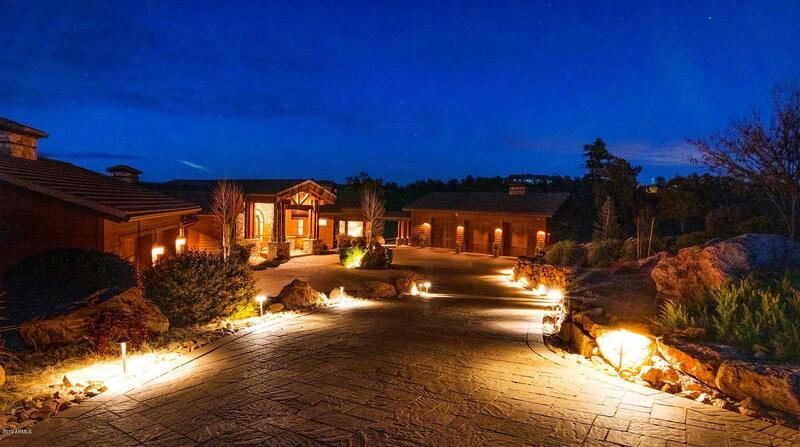 "Luxury Santa Fe home situated towards the very top of The Ranch in Prescott. 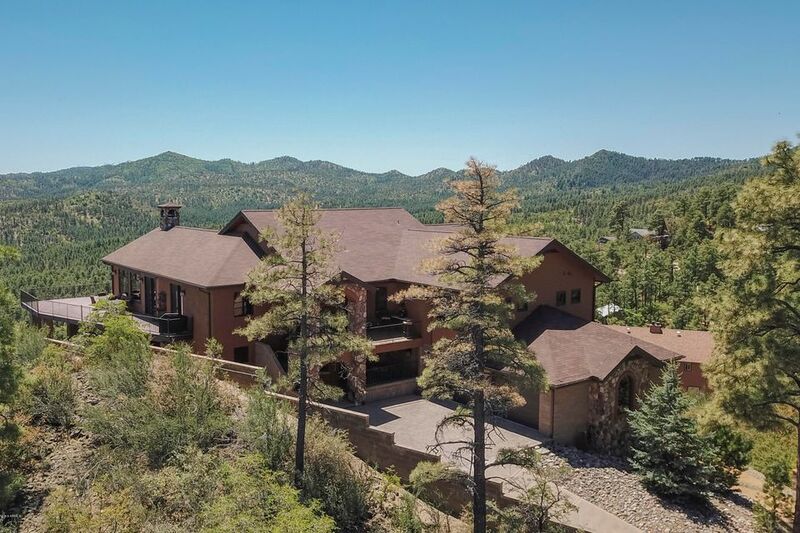 This magnificent home borders National Forest with panoramic views to city lights, Mingus Mountains, San Francisco Peaks and National Forest. Kitchen features large circular eating area, WOLF 6 burner range, ASKO D/W, & SUB-ZERO side by side stainless refrigerator and level 5 granite counters. 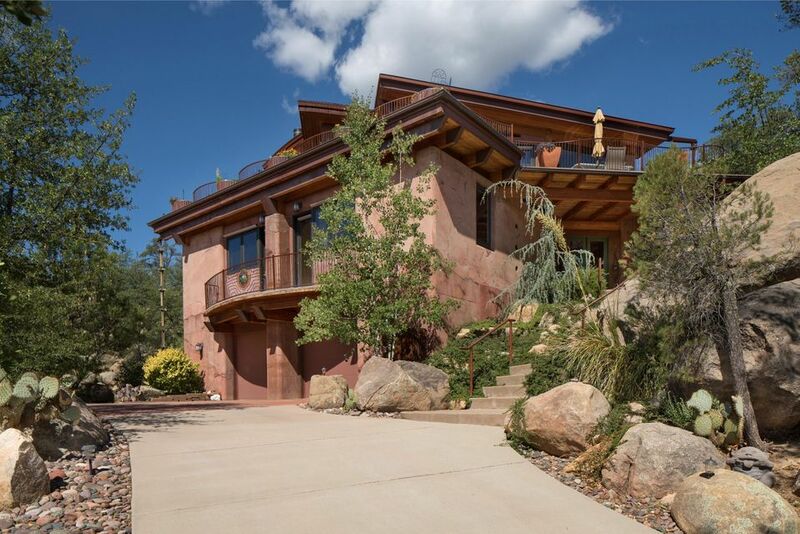 Other home features include dramatic stone fireplace, travertine flooring, disappearing fold-away windows with unobstructed view"
"Statement Custom home designed for entertaining, on 2.01 ac. Original footprint of home was built in 2007, hardwood flooring, flagstone, and travertine. Custom cabinetry throughout the main floor, large Master suite, office and guest suite. The formal dining room, Great Room and family room offer wood and glass sliders leading to the barazilian Camru plank deck. The Chef's kitchen with its Wolf Range and detailed cabinetry, oversized kitchen island and raised bar offers abundant seating and "
"Majestically poised 5 ac mountain top parcel bordering national forest and commanding hundred mile views, sits the most environmentally artistic home in Prescott. Genius of renowned architect Mickey Muennig is exhibited in the curvilinear organic architecture which embraces nature while integrating structures with the surrounding environment. Using recycled woods, glass, metal, & concrete, an estate which invites in nature, the changing seasons, & light was created. 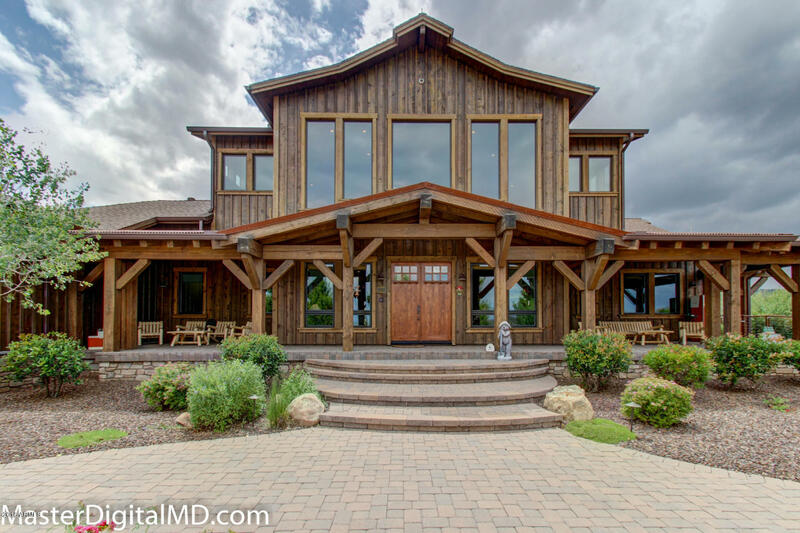 From the glass atrium to the "
"Enter through the gates of High Valley Ranch to find this magnificent custom built home on over 2 acres, No stone has been left unturned in the design, engineering and high end finishes. 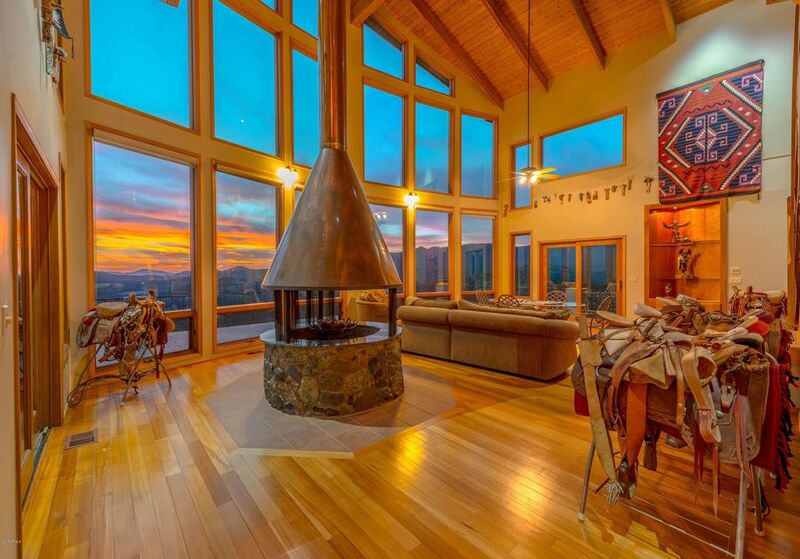 Enjoy amazing sunsets from over 1500 ft of Trex covered deck with panoramic views. While entertaining, listen to the cascading waterfall in the lush canyon below and view soaring mountains in the worlds largest Ponderosa Pine Forest This light filled luxury home with soaring ceilings, has a perfect live on o"
"Custom home designed by noted architect John Sather of Swaback Partners Scottsdale. Ranch contemporary open floor plan, high ceilings. Windows bring the outdoors in. Custom touches throughout, reclaimed barn wood flooring and entry door with custom hand forged door pulls. Custom cabinets and forged iron highlights. 3659sf main home, master suite, office with built-in partners desk, exercise room that could be bedroom.Radiant heat throughout main home, or forced air through heat pump. Large"
"Timeless Traditional -Ranch Architecture with broad rooflines, deep porches, rough-hewn wood & Native Stone accents. 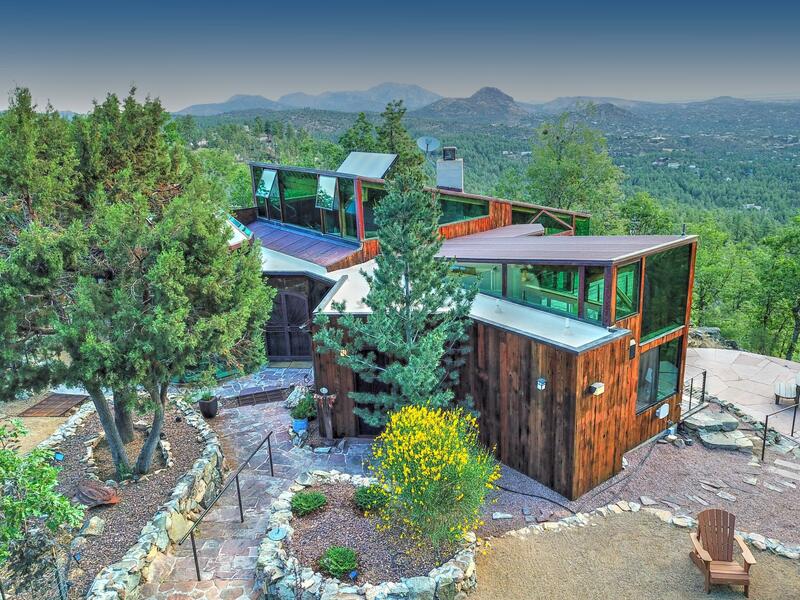 Unobstructed views of ''Granite Mountain with Elevated & covered deck. Home blends into the natural surroundings with numerous features & upgrades including a spacious Great Room w/ Lrg FP, built-in book cases & vaulted ceiling, Gourmet kitchen w/ double island, distressed cherry cabinets, granite counters & walk-in pantry, Hardwood floors , tin ceiling, walk-in pantry, Master be"
"Majestic Hassayampa perched towards the very top of Hassayampa and close to Prescott National Forest. 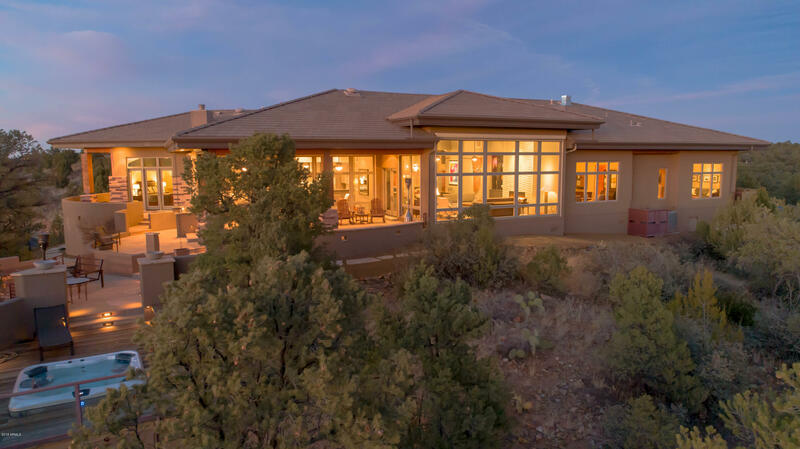 This beautiful main level home offers amazing long distant views of city lights, National Forest, Thumb Butte and the San Francisco Peaks. Features include functional floor open floor plan with gourmet kitchen, ''Keeping Room'', mastersuite, Ensuite and Office/Den on main level. Lower level offers separate access and family room, kitchen and 3rd Ensuite. 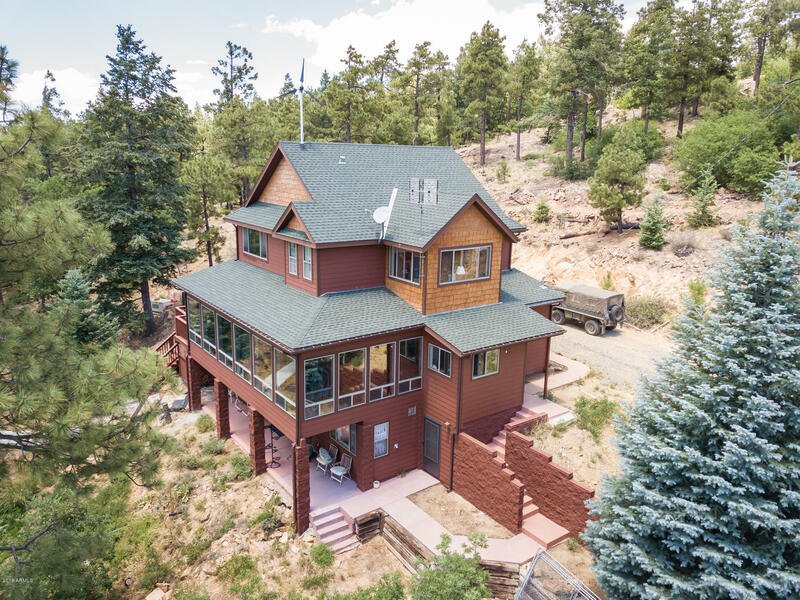 Perfect for guests and family or extended"
"Beautiful Prescott retreat surrounded by the majestic Granite Mountain wilderness & Prescott National Forest. 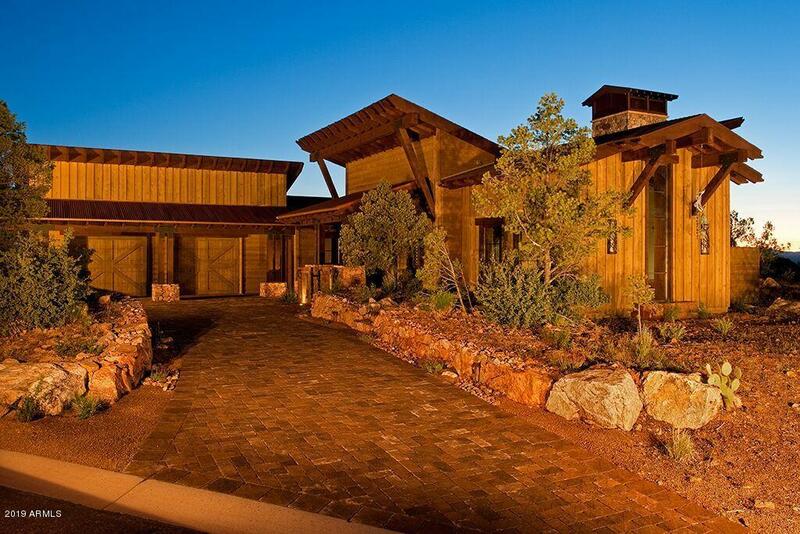 The American Ranch Community is masterfully located with horse privileges. 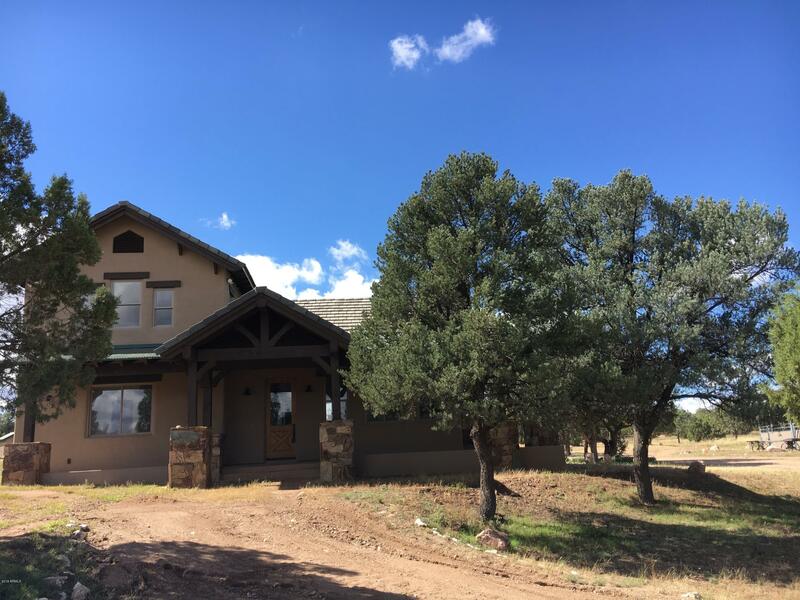 The property features over 3 acres with the main house including 4 bedrooms & 4.5 bathrooms, as well as an apartment loft with 1 bedroom & 1 bathroom located above the detached RV Garage. There are walls of windows & private balconies that showcase the stunning views at every turn. 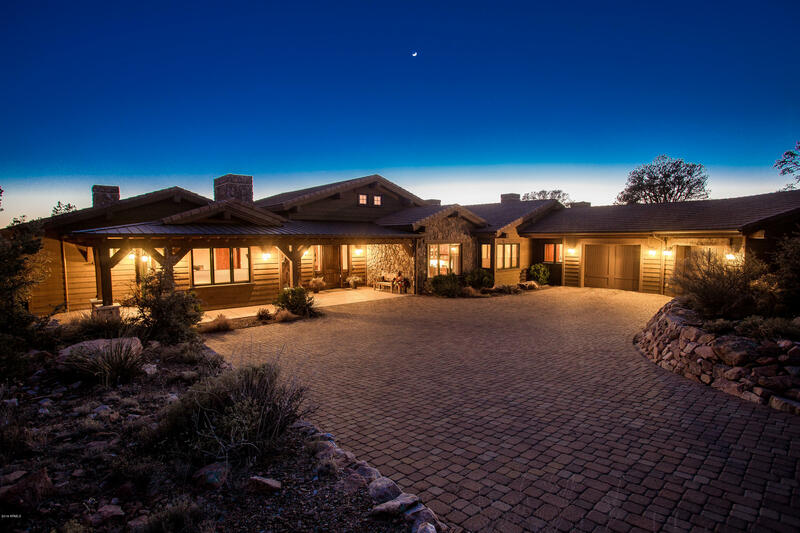 A huge butler's pantry, heated t"
"Stunning & sprawling estate now offered in Williamson Valley Ranch offers sweeping panoramic views on a fully fenced & gated 3 acre parcel. Attention to detail & custom craftsmanship doesn't say enough; there was no expense spared in building this dramatic home. Some of the highlights include open & spacious great room concept which is complimented by a tumbled flagstone fireplace, exposed wood beams, formal dining area accented by Maitland-Smith chandelier & sconces, massive laundry room plus u"
"Beautiful Custom built home sets on 20 acres of prime forest land with all mineral rights! 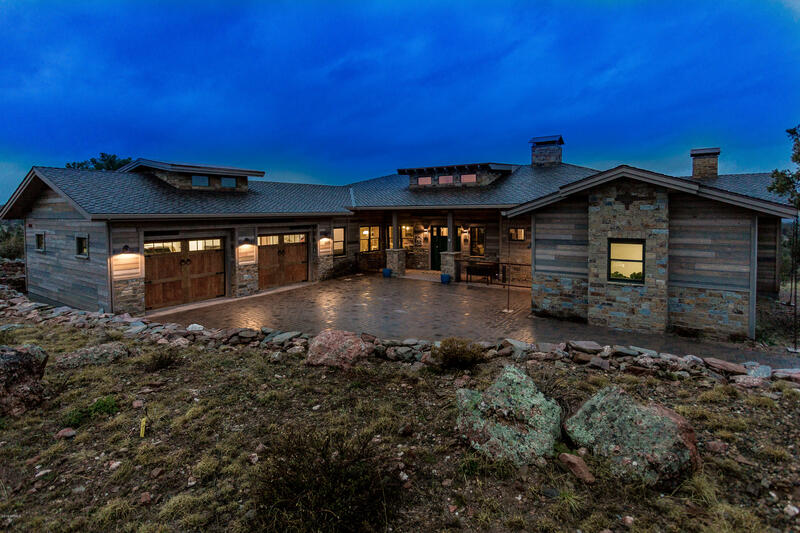 The home was designed to resemble a 1920's farm house and blend into the mountain scenery. 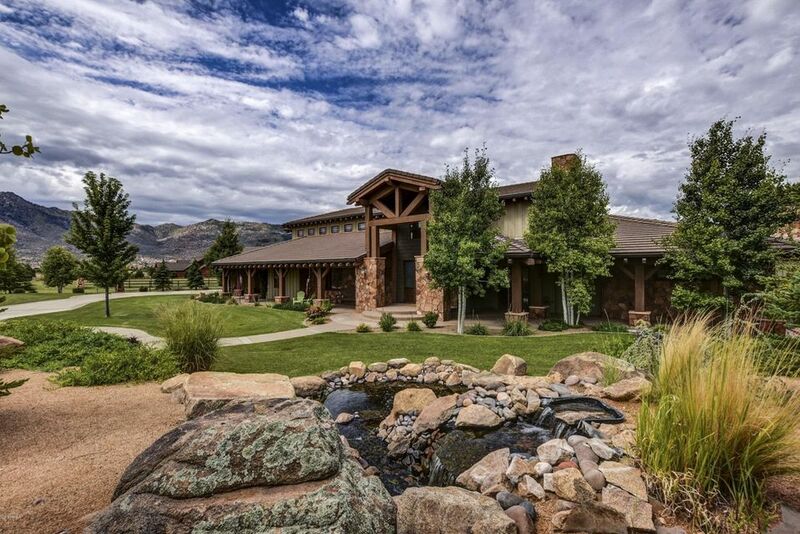 There are 3 additional parcels with a total of 47 acres that convey with the purchase of the home. Big and bright Kitchen with a beautiful antique gas cook stove built in the 1800's, 4 ovens, 6 burners and a broiler. All cabinets, bookcases and woodwork are custom made. 3 Fire places all installed with antique wood m"
"Premier home located just minutes away from the downtown Courthouse Square and local hospital in desirable Yakashba subdivision. 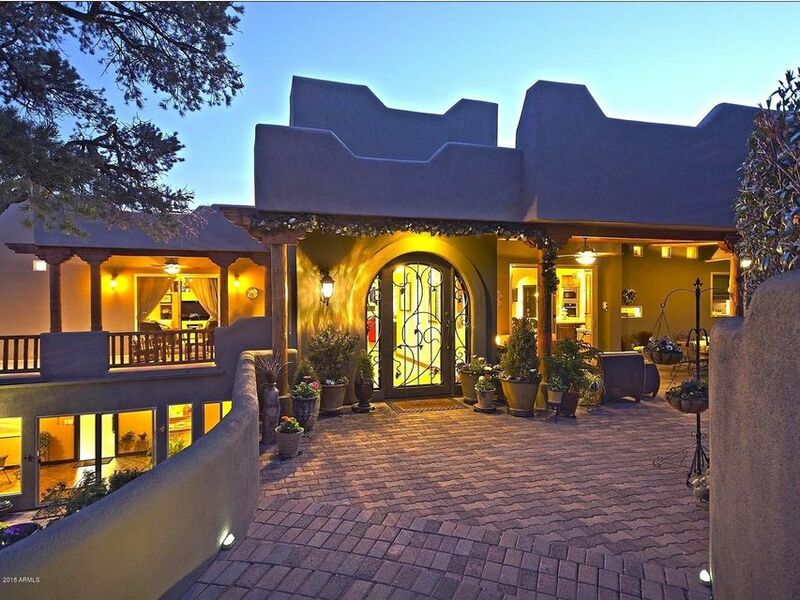 This quality Santa Fe home was remodeled in 2009 with assistance from local architect Lynn Vanlandingham. 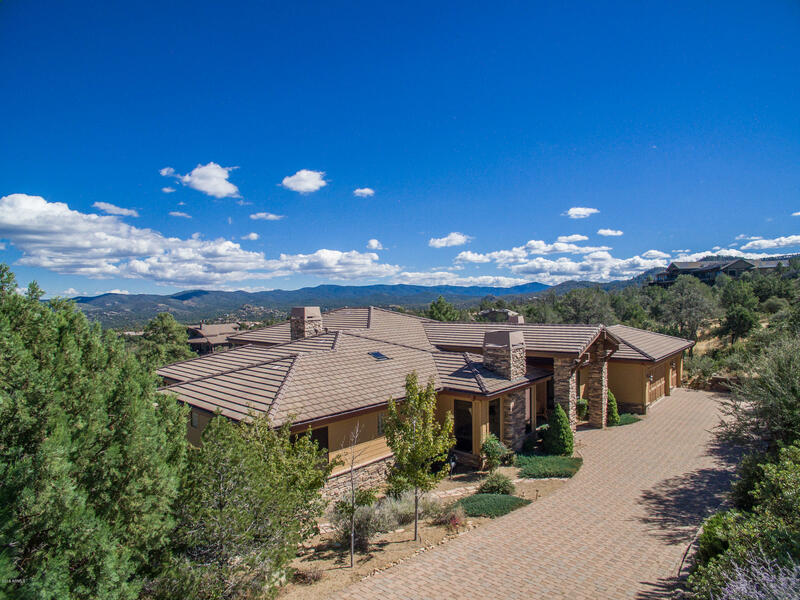 This exceptional residence offers main level living, long distance views of Thumb Butte and National Forest, over 2 acres, 5 car total garage plus plenty of guest parking and In-Law apartment on lower level. 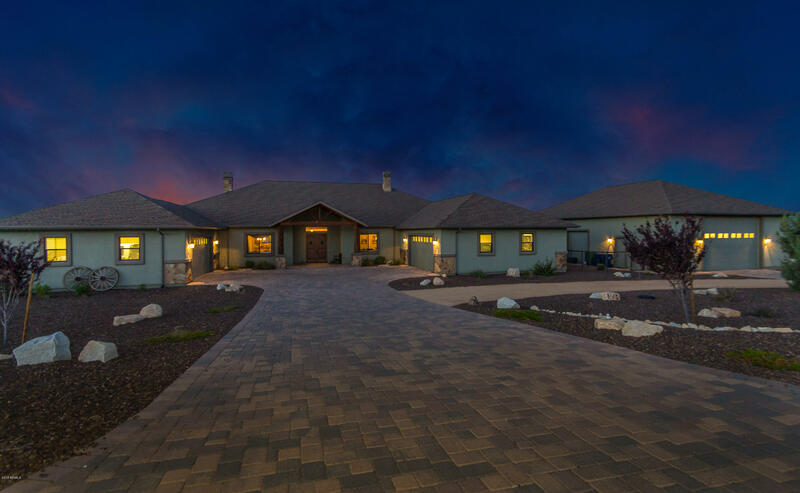 Features include gated front courtyard, ''Cantera'' wroug"
"RV Owners or Car Enthusiasts large detached RV garage or store up to 6 collector cars. 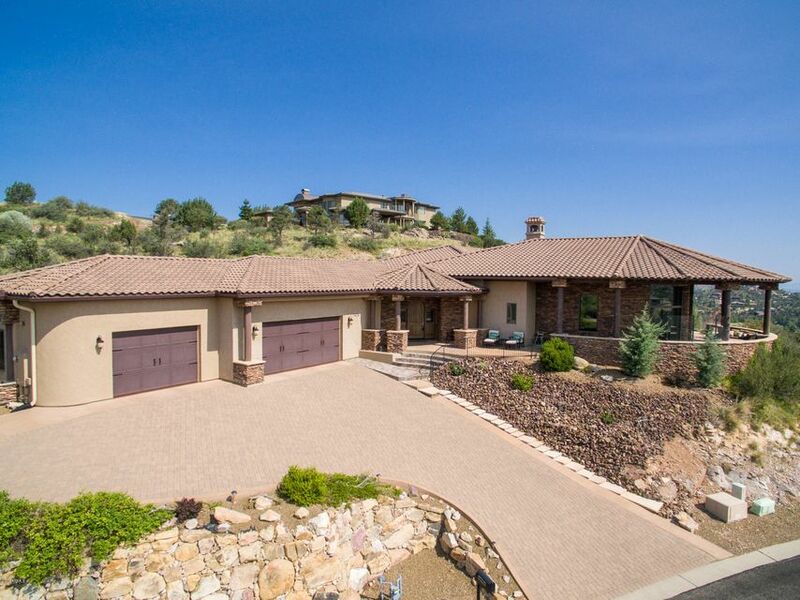 Amazing views from every room in this custom-built home on 1.62 acres within minutes to downtown Prescott. This home was designed with great thought and detail from upgraded insulation throughout, zoned AC & heating, MI Energy Core windows, huge master suite with deluxe shower, 4.25 base trim throughout, upgraded pull up/down blackout shades, full bar with fridge, sink and fire place in the game room, 8ft door"
"Dramatic custom home in Forest Trails located just a short drive to downtown Prescott with views of National Forest and beyond. Many upgrades in this contemporary elegant home. Primarily single level home except for 8 stairs to the Master Suite. This amazing home features 3 bedrooms (all suites) plus theater/exercise/office room, 10-12 foot ceilings and cathedral ceilings with wood beams and tongue in groove accents. Outdoor covered front patio captures the long distance views. 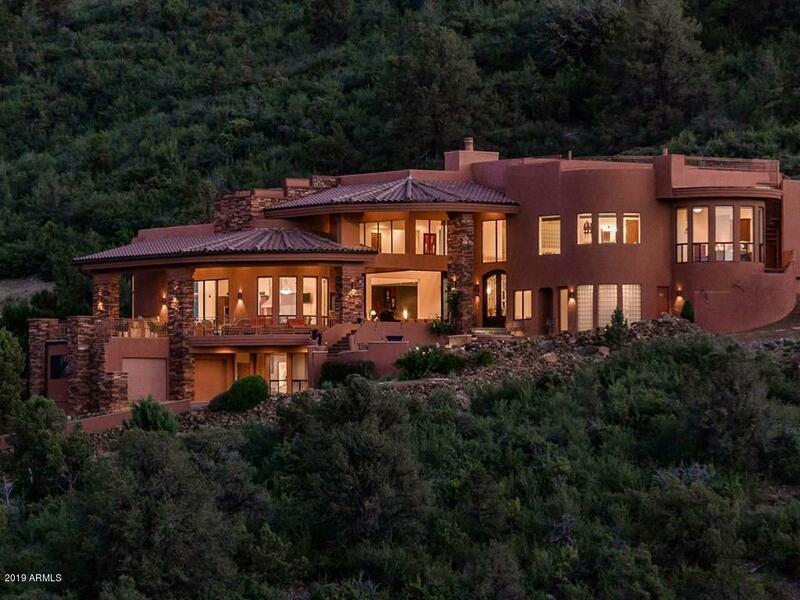 Expansive living "